"Charlie Chan is by license from Leisure Concepts, Inc."
As the Chan family visits the Zambini Circus, it's owner, Mr. Zambini, informs Charlie Chan that someone is out to ruin his circus. 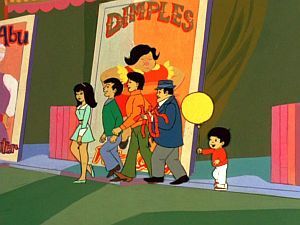 When Dimples the fat lady is stolen, Chan and the kids, suspecting an inside job, seek to find the missing star performer and solve the case. The credits for this episode reveal numerous changes to the production staff. The new portions of changed credits appears in a different, plainer text than the rest of the "original" credits. Also the following note was added to the copyright portion: "Charlie Chan property is by license from Leisure Concepts, Inc." From this episode on, the running time increases from 20 to 22 minutes, with the extra two minutes being used to take a pause in the action and feature a song by "The Chan Clan." From the very start, the basic plot of this episode bears a resemblance to that of the film Charlie Chan at the Circus. Ticket Seller: "Is that your family or a camp outing?" Mr. Zambini, the owner of the circus remarks, "I know who's responsible, the Dingaling Brothers Circus." This would be a reference to the famous Ringling Brothers and Barnum & Bailey Circus.